The rural landscape is showing increasing signs of stress. Farm trees are dying steadily, often without replacements, and those that are alive look very sick in many districts. Clearly the status quo isn't working. We need to take action or bit by bit we will lose the trees that give our landscape its unique character. Dieback is not the result of any single factor like a disease organism or a long hot summer. Usually there are several effects working against a tree for years. When something extra adds to the burden, the tree is in such a weak state that it can't cope and dies. It's tempting to blame it on the drought or the mistletoe, but a deeper look may give us more control over the situation. In a healthy forest environment with undisturbed soil, water and nutrients can easily percolate down through the topsoil to the root zone. Good soil structure and the layer of leaf litter ensure sufficient storage of water for the drier times. Farm trees which have been subject to cropping and grazing pressure for many decades do not have such healthy soil. Physical compaction by stock hooves, mechanical changes to soil structure, loss of friable top soil, loss of protective leaf litter, increased exposure to high temperatures and drying winds, all add up to more run off and less water retention in the root zone. 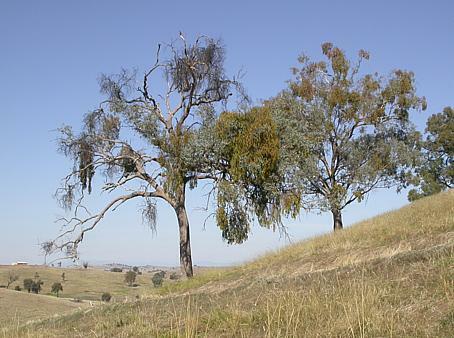 The tree becomes stressed from lack of water and nutrients. The extent of this change in soil quality can be seen in the number of living soil organisms that are lost after years of over use. Research in Western Australia has shown that healthy soil in Jarrah forest supports a diverse array of microscopic insects — 93 species in all. These play an important role in nutrient cycling to assist tree growth and also create an open, porous soil which gives tree roots better access to water and oxygen. By contrast, soil in adjacent grazing land had only 20 species, and cropping land could only support 6. Once trees become stressed, they are more prone to serious insect attack. Ironic as it is, researchers have shown that dieback trees produce foliage that is more attractive to insects than healthy, unstressed trees. The big old Red Box on the left is all but dead, even the mistletoe itself is dying. In a few more years, the tree on the right will die too. For example, following a severe insect attack, the new growth is richer in nitrogen, phosphorus and potassium than the original foliage and therefore even more attractive to insects. If the tree is loaded with extra nutrients from stock manure or fertiliser, this only exacerbates the problem, and their numbers increase to the extent that natural predation cannot control them. In one experiment, dieback trees in a grazing paddock had 10 times the mass of insects that were found in healthy trees. Out on the lower slopes, trees can be stressed by the extra water from altered drainage regimes and ground water levels. Combined with the extra nutrient influx, this can stimulate trees to produce new growth almost continuously, inviting a continuous insect attack on the soft nutrient-rich foliage. This reshooting-defoliation process becomes a vicious circle, so the tree never gets a chance to build up its food reserves and is not able to cope with further stresses so well. It also adversely affects the amount of seed that the tree can produce so there is likely to be less natural regeneration. Stressed trees are also more susceptible to wood boring insects such as Longicorn Beetles. In a balanced, healthy environment, trees produce a thick red resin, which seals off damaged areas like borer holes. This defence mechanism is impaired in stressed trees. Isolated trees are more exposed to climatic extremes, so effects of water stress and the ensuing cycle of reshooting and defoliation are inevitable. Surrounded by pasture, they are also more open to attack from defoliating insects like Scarab Beetles, which spend their larval stage eating roots of pasture grasses. 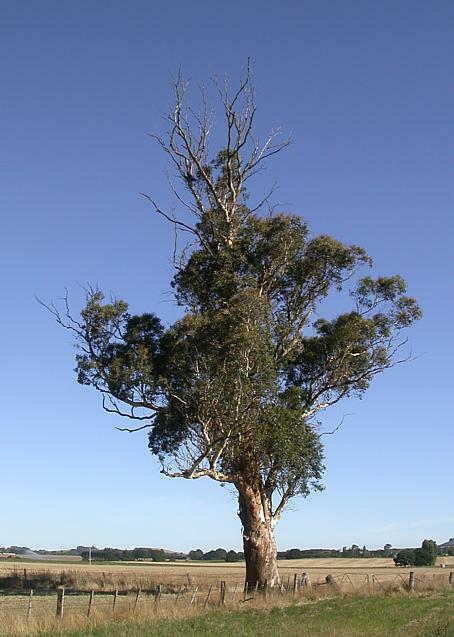 The better nutrition available from the roots of fertilised pasture promotes higher larval populations in the soil, which in turn leads to greater tree defoliation when the adult beetles emerge. The lack of nectar rich understorey shrubs adds to the problem because the host of insect eating birds, lizards, mammals, parasitic wasps, flies and spiders are not present to keep the defoliators in check. The wasps for example need a nearby source of sugar to provide the energy to dig for Scarab Beetle larvae and lay their eggs. In a healthy forest situation wasps alone can parasitise over half of their available prey, and birds take a similar amount. Mistletoe plants are part of a healthy ecosystem and are normally kept in balance by several natural processes. Once the understorey is gone, this balance is disturbed and mistletoe becomes a problem. 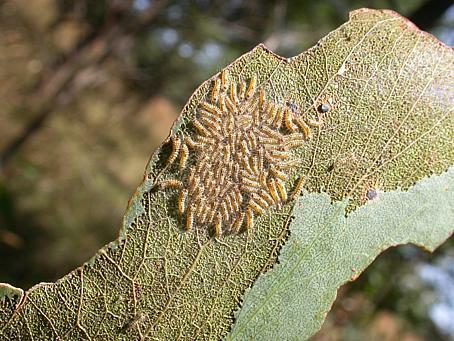 For example, the larvae of Imperial White Butterflies need mistletoes as their sole food supply, and whole mistletoe plants can be completely defoliated by a colony of these caterpillars. However, in the typical rural landscape, the understorey shrubs and wildflowers have largely disappeared, and along with them the nectar source and protective cover for adult butterflies. Without butterflies there will be no eggs, no caterpillars, and so the mistletoe proliferates unchecked. A sizeable number of birds eat mistletoe fruits in a healthy forest, dropping the seeds randomly on the forest floor where mistletoe cannot grow. However, loss of protective understorey shrubs prevents most of these birds living in open farm land. This leaves mistletoe birds without competition to spread the seeds very precisely, placing their droppings only on the tree branches where the seeds will grow. So again the mistletoe is advantaged. Mistletoe plants also do better on forest edges where there is more light available. But in the typical rural situation, where trees are isolated, all the trees are on the 'forest edge". Once mistletoe has taken over a large proportion of a tree crown, it simply outcompetes its host for nutrients and water. For trees that are already suffering other stresses, it is often the straw that breaks the camel's back. 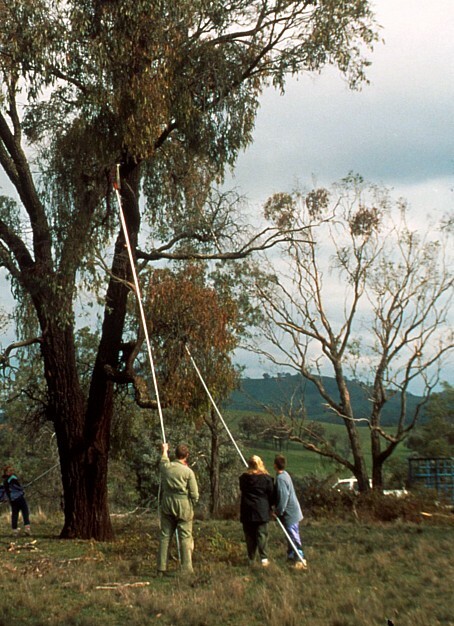 Mistletoe removal near Lurg, autumn 2004. Remove stock to reduce nitrogen levels in the soil and fence out the area to prevent ongoing compaction. This will also allow the build up of leaf litter, which is important for moisture retention and the long-term establishment of nutrient cycling. It is important to fence a large enough area to protect the entire root zone of the tree and to allow for natural regeneration of tree seedlings which normally develop only out beyond the root zone where there is less competition with the parent tree. Planting a variety of indigenous shrubs as habitat for insect-eating birds, mammals, lizards, parasitic wasps, flies, and spiders will provide natural long term pest control for the trees and even the pastures out beyond. This works best when several trees are fenced together, is cheaper than fencing trees individually, and provides better stock shelter than isolated single trees. In obvious stock camping areas, it may be necessary to remove the layers of nitrogen-rich surface soil. It has been shown that soil in stock camps has four times as much ammonium and forty times as much nitrate as soil under healthy trees. After removal of stock manure, a light scarification of the surface allows better water penetration and uptake by the trees. Where the soil is severely compacted, radial ripping to about 15 cm depth may be required. In severe cases of mistletoe infestation, manual removal will almost certainly be needed. Research has shown that mistletoe removal does improve tree survival markedly, but that reinfestation can easily occur if the root causes of stress, isolation and lack of understorey are not addressed. Again, the best approach is to fence off an area of trees to exclude stock; encourage natural regeneration; and plant indigenous shrubs like Sweet Bursaria, everlasting daisies, and rice flowers to provide nectar for the butterflies. Saving the valuable old trees we still have should be the basis of any attempt to restore wildlife habitat. It will be 150 years before the seedlings of today can produce so much nectar or hollows for nesting.